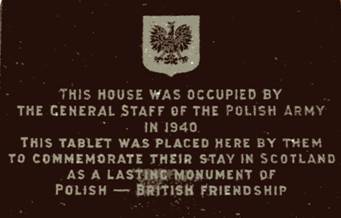 Around mid July 1940, HQ Polish Camps in Scotland moved from Glasgow to Eastend House. Lieutenant-General Stanisław Burhardt-Bukacki was appointed its first Commanding Officer. Amongst the duties of this HQ included the issuing of organisational orders regarding Polish units in Scotland into a brigade group structure; the creation of new units, administration etc. Strength of the Polish Army in Scotland at this time was around 4,600 Officers and 12,000 Other Ranks. HQ of C-in-C Polish Forces remained in London. During August it moved into the Rubens Hotel. On 24th July, the HQ was renamed HQ Camps and Units of the Polish Army in Scotland. Under its command lay the camps at Biggar, Douglas and Eliock (Canadian Cadre Rifle Brigade) as well as HQ Troops at Crawford. At Biggar and Douglas respectively were the 1st Rifle Brigade and 2nd Rifle Brigade (10th Armoured Cavalry Brigade). Two infantry battalions and an engineer battalion were already deployed in the defence of Scotland. All of the Army in Scotland except 2,250 were under canvas. General Burkhardt-Bukacki was transferred to London to direct the Bureau charged with the preparation of training manuals, &c. He was replaced in Scotland by General Marian Kukiel, up to then the Vice-Minister of War. The HQ was of a relatively small size, composed of some 90 Officers and Other Ranks. Around the beginnning of September, General Kukiel, with his staff, accompanied by a representative from 4th British Military Mission made a reconnaissance of the Angus and Fife Sectors. This was a precursor to the Polish Army taking over these sectors of the Scottish east coast. In the meantime, the HQ under General Kukiel was renamed HQ Military District in Scotland on 21st September 1940. On 3rd October, Gen. Marian Kukiel was nominated the Commanding Officer of 1st Corps (established on 28th September 1940). Behind the creation of the 1st Corps lay the future desire of General Sikorski to expand the number of operational units. On 1st Polish Corps passed under the Command of GOC Home Forces. On the day that the Polish Armed Forces in Scotland are transferred to Operations Directorate of the Scottish Command, I wish to express my conviction that the units accountable to you will nobly continue the praiseworthy traditions of Polish Armed Forces. During this war Polish Forces bravely carried out their duty in defence of Poland against overpowering enemy forces, as also in Norway and in France. I am confident that as need arises your units, united in brotherhood of arms with British units, will defend the British soil with the same sense of duty and dedication. 1st Polish Corps left Eastend House and moved to near Bridge of Earn.